Cheng Yu-tung won’t take no for an answer. The Hong Kong tycoon’s flagship real estate group New World Development is trying again to buy out its China subsidiary. The new cash offer of $2.8 billion for the 31 percent it does not already own looks safer than the last. It is more generous – and avoids the archaic rules that killed his bid in 2014. Back then, Cheng suffered a bizarre defeat. Shareholders with less than 1 percent of the votes blocked a buyout bid for New World China worth HK$6.80 per share or $2.4 billion. Rules in the Cayman Islands, where the unit is domiciled, require takeovers structured as a scheme of arrangement to be approved by a majority in number of shareholders present – a so-called “headcount” rule. The new offer looks more secure for two reasons. First, this is now a straightforward tender offer which isn’t subject to the headcount test. Instead, it will go through when New World has acceptances from 90 percent of minority shareholders. Second, Cheng is offering to pay HK$7.80 per share, or 15 percent more than his previous offer even though shares in the China unit have languished since the previous bid. Success would give New World full control of a faster-growing, higher-margin business, Eikon data shows. It also extends a recent deal-making frenzy by Cheng and younger generations of his family. Since December, their companies have sold mainland property assets worth more than $5 billion to China’s third-largest developer, Evergrande. That helps New World refocus on top-tier cities as the world’s second largest economy slows. The city’s elderly moguls appear ever-more determined to maximize the value of their sprawling empires. Malaysian entrepreneur Robert Kuok, who has extensive interests in Hong Kong, just sold the South China Morning Post to Alibaba. Li Ka-shing, Hong Kong’s richest man, has also been reorganising. Shareholders recently rejected a $12.4 billion offer to merge his listed energy and infrastructure units, despite a small sweetener. But if Cheng is any guide, Li will be back for more. 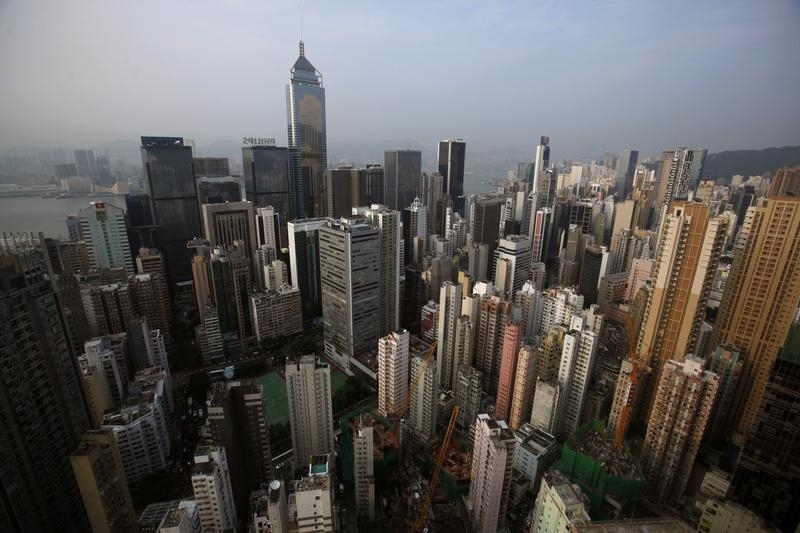 Highrise residential and commercial buildings are seen at Hong Kong island August 29, 2012. Hong Kong listed New World Development announced on Jan. 6 an offer to its China property unit private in a deal that values the group at HK$67.8 billion ($8.75 billion). The real estate group said it would offer HK$7.80 per share for the 31 percent of shares that it does not already own in New World China Land. The price is equivalent to a 25.6 percent premium to the closing price on Dec. 31, the last trading date before reports of an offer emerged. The offer is conditional on New World Development acquiring 90 percent of the total outstanding shares and 90 percent of the independently held shares. The company intends to finance the offer from its cash reserves. Its main financial adviser HSBC will also provide a credit facility worth HK21.5 billion. Under a so-called “headcount rule”, independent shareholders blocked an earlier effort to take the group private for HK$6.8 per share in June 2014 despite 99.8 percent of shares voting in favor of the deal. Shares in New World Development fell 0.52 percent to HK$7.62 by mid-morning local time. Shares in New World China Land rose 20.6 percent to HK$7.49. The deal requires the approval of New World Development shareholders. Chow Tai Fook Enterprises, which owns almost 44 percent of the real estate group’s shares, will vote in favor of the deal.